If you drive from Jerusalem towards Ben Gurion airport and the coast, you generally choose one of two alternative routes. One is Route 1, the main highway now under massive reconstruction of the first ten kilometers that wend their way up and down the hills around the capital. The other is Route 443 that passes Givat Ze'ev and then Beit Horon. 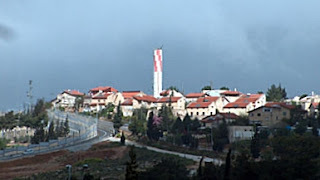 Yesterday, in the small Beit Horon community (population: about 1,300, and a long Jewish history) that abuts the busy commuter route, a pair of Palestinian Arab men with terror on their minds made their way unhindered into the heart of the neighborhood - evidently via a breach in its periphery fence or by climbing over - towards the makolet, the local grocery store. This is the fourth attack in a week in which Arabs have brought their terror right inside Israeli communities; the others were in Tekoa, Otniel and Anatot/Almon. They stopped briefly to place several home-made explosive devices just outside the shop. Just before or after that, they evidently spotted two women, one walking along the sidewalk, a second one in the nearby car park, and stabbed them both brutally. Security camera footage [here] shows them then being stopped at the entrance to the makolet by its proprietor aided by what he had at hand - a shopping cart. This worked. Sometime very soon after that, a security guard shot them both. They are now dead. Members of the Israel Police bomb squad, called to the scene, neutralized the bombs, three of them. The stabbing victims were given emergency treatment and then rushed to hospital in Jerusalem. One is 23 years old, and was taken by ambulance to the Hadassah Medical Center hospital on Jerusalem's Mount Scopus in critical condition. The other, a woman said to be in her late fifties, has moderate injuries and is now at the capital's Shaarei Zedek Medical Center. This morning, Tuesday, news reports say the younger of the two victims died of her injuries during the night. We still have no knowledge of who they are. That will surely come later today. It's reported that they posted on Facebook in the hours before the murderous attack that they were "going to hunt porcupines". One of the thugs was immediately claimed [see poster] as "son, martyr, hero" by Fatah, the terrorist band headed by PA president Mahmoud Abbas. Their photos, part of the process of elevating armed thuggery to something higher and worthy of emulation, already began popping up across the Arabic media [here, for instance] in the hours after the terrorism. Knowing how these matters work, there is no room for doubt that their stabbing of two unarmed women makes them heroes in the perverted society from which they emerged, starting at its highest levels. Their deaths at the hands of a security guard turns them in martyrs with custom posters for family and friends to admire. The IDF, immediately after the attack, set up roadblocks in the area and cordoned off nearby Beit Ur al-Tahta "with only those requiring medical attention permitted to enter or leave", in the words of a Haaretz report. 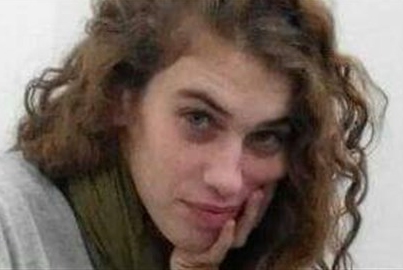 UPDATE Tuesday January 26, 2016 at 8:00 am: Israel National News says the woman murdered in Beit Horon yesterday is Shlomit Kriegman, 24, who "did her National Service with Bnei Akiva in Beit Horon. During the last year Shlomit lived with her grandfather and grandmother in the community." 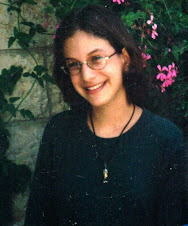 Her funeral will be at 1:00 pm today (Tuesday) at Jerusalem's Har Hamenuhot Cemetery. May her memory be a blessing. Something is not correct in the news reports. "Footage from security cameras in the supermarket in Beit Horon, outside of which a stabbing attack took place Monday night, shows how an intrepid shopper managed to keep the two knife-wielding Arab terrorists at bay with a shopping cart." 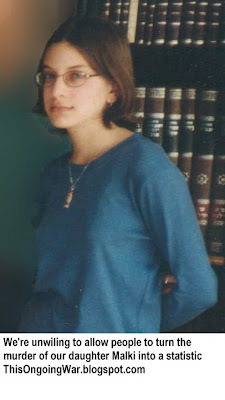 The two terrorists were teenage girls, as shown in the video in connection with the death of Shlomit a"h. Is your report about a different incident? Two arab men? Were they also involved, because the other report indicated there were 3 bombs nearby. Very confusing. In yesterday's Beit Horon terror attack, the one which cost the Jewish people the life of the lovely young woman, Shlomit Kriegman, the attackers were men. They not only knifed their victims but also planted bombs. You did not link to the video, so it's risky to guess which women you mean, but women were not the attackers but rather the victims in Beit Horon yesterday.